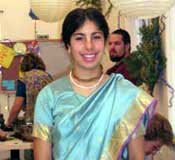 Vaidehi:"I have to say, as part of the 'new generation' we are beginning to step up and speak something about Krishna consciousness to our friends and the public. I am curious, what have you personally experienced is the most effective way to preach to people?" Have you ever wondered how the devotees came in contact with the movement? Let's ask them! Sitting outside on a sunny day at the Soquel Seva Ashram, I arranged to interview Sripad Bhakti Premik Siddhanti Maharaj after noon prasadam. We sat behind the Tulasi house overlooking the back garden of the Soquel Ashram. 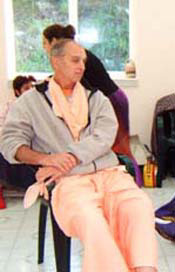 Sripad Siddhanti Maharaj sat himself in a chair across from me and began to tell the story of how he first encountered the devotees and was introduced to Krishna consciousness. I was working at the merchant ship which happened to be in Australia. I read an article in the paper about how an Indian Swami had gone to San Francisco, the Haight-Ashbury, which was a new area and the center of a new counter-material-culture in favor of spiritual culture. So I read that this Indian Swami had gone there and was holding some classes with chanting and dancing. So I thought, "I should immediately go there," because I was interested in spiritual life and very tired of material life. I caught a ship and went there and began looking for that Swami but didn't know how to find him. I had heard the name "Krishna" somewhere so I was looking for a Krishna temple. Eventually I found that Krishna temple at 518 Frederick St. on Rathayatra day, July 1967. The devotees were in front of the temple preparing a cart for Jagannath on the back of a flat bed truck. I had finally found the temple where the Swami was supposed to be but he wasn't there because he had gone to India but the devotees said he'd come back. After talking with those devotees I saw that there was a friend of mine who I had known previously from my material life. He was on the back of the flat bed truck helping to prepare for the festival and had already joined that temple. So they had the festival and took Lord Jagannath all the way to the ocean. I walked along and began chanting Hare Krishna. It was a five or ten mile walk - it was very nice. Ever since then I began to go to the temple regularly because they had a free lunch every day at noon, and then I would visit my friend. I kind of liked the devotees. This was all in July too and they kept saying the Swami would come back sometime and so I was basically going to the temple, then going to San Francisco State to work on a teaching credential and continuing with school, while I waited for the Swami to arrive. Finally, he came back in December and that was all it took. Just one time to see him and I knew this was where I was supposed to be. I moved in and was living in the same house with him. I remember that the first night he was there he was living in this room and I felt he was very lonely. He was a very old man and I felt he had a family and children and many friends in India and now he was living with a bunch of young people who were not so advanced, at least materially. I felt that he was lonely and liked to have people around so I thought I would go to his room and sit with him to keep him company for a little bit. I went in the room and immediately he started talking about Krishna and looking at these posters on the wall of Krishna and Arjuna at the Battle of Kuruksetra, and of Krishna in Vrindavan with the Gopis. He began talking about Krishna and describing the pictures. The way Srila Prabhupad was talking about Krishna I felt he was very close to Krishna. It was like Krishna was his friend. I didn't know who Krishna was but I felt he wasn't lonely because he had a friend named Krishna. So after about a half hour I felt very foolish - I couldn't keep him company because Krishna was there, he was a friend of Krishna so I just left the room. Anyway, one thing led to another. I was living in the same house with him and every morning we would go on walks together at the Golden Gate Park. I would drive him there, I would drive the the only car there and slowly like that, he would lecture in the evenings in the temple and lead kirtan. It didn't take very long before I realized that this is where I was supposed to be. Finally, even though I thought I was supposed to be here, still I wasn't sure so. Finally, Srila Prabhupad asked the other devotees if I wanted initiation. I was so foolish I couldn't ask, so he asked, and I had to say yes. What else could I do? That is how I joined Krishna consciousness. After you took initiation how did you continue your spiritual life? Well, Srila Prabhupad would come and go. He just wanted to maintain the temple and there weren't that many other devotees there since they lived outside and worked. They would come in the morning to cook, kind of like here in Soquel. I stayed in the temple with the temple president Jayananda Das. He was a cab driver and so I helped during the day by cleaning and doing other duties like receiving guests and talking to them about Krishna consciousness. People were always coming over because it was a nice populated area in Haight-Ashbury. I basically talked to guests and helped with the prasadam and the evening program. 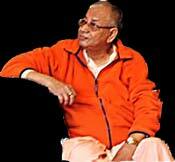 The word was always that "Swamiji," as we called Srila Prabhupad in those days, would come back. He would go to Los Angeles and here and there, and kept coming and going. He would always say that he would come back so I knew that he would be back and waited for him. Slowly, I would get more involved. Eventually, the temple president wanted to go to Los Angeles and work with a different group of devotees, so Srila Prabhupad asked me to be the temple president and so I did that for a while. Maybe one year later, I was asked by the G.B.C. (Iskcon's Governing Body Commission) to go to Vancouver, Canada, and start a temple there. I did that and after a year in Canada, the G.B.C. came and said that Srila Prabhupad wanted a group of devotees to go to India and help him preach and that it would be good if I went. I went to India with Srila Prabhupad for about a year and that was really nice. That was the first time I really began to have a lot of association with Srila Prabhupad. In India that year there were twenty of us traveling with Srila Prabhupad. It was really nice because we would eat with him and spend a lot of time with him. Eventually Srila Prabhupad saw that I was getting sick. I didn't know it at the time but I actually had tuberculosis. I didn't know, but he did, and told the other devotees that I was sick and advised me to go back to America where I could get proper care. I did as he said and went back to Los Angeles where the devotees there put me in a hospital immediately; I stayed there for about two years. Srila Prabhupad would also come and go but we would always maintain some connection. He would come see me and say something. I always felt that I had to try follow his order, what his desire was. I felt that was very important. If he wanted something he would usually tell me and I would try to do that up to some degree. Finally, he left this world in 1977. I didn't really hear him tell his last desire and wishes that his disciples take instruction from Srila Sridhar Maharaj, but when I eventually did hear that from a God-brother, namely Sripad Goswami Maharaj and others, I knew that was Srila Prabhupad's last will and instruction because I knew Srila Prabhupad and always tried to follow him. This all happened when I was living in Santa Cruz, California, because I was sick, but I knew this is what he wanted. Hearing this last instruction I went to India right away to see Srila Sridhar Maharaj. From that point, I kept a connection with him and his devotees. Srila Sridhar Maharaj helped me along in my spiritual path. At the end if his lifetime here, he told me to serve Srila Govinda Maharaj, to stay with Srila Govinda Maharaj and take care of Srila Govinda Maharaj. That is what I started to do after Srila Sridhar Maharaj left. So then, when did you take sannyasi and why? Well, I was helping Srila Govinda Maharaj in India and other places in the world as Srila Sridhar Maharaj and Srila Govinda Maharaj had asked me. One day, Srila Govinda Maharaj asked me to take sannyas. He said: "They're making your danda down there - it will be ready tomorrow." I thought, "Oh my gosh, I guess that's what you want Maharaj." This is how he told me to take sannyasi. Maharaj did your life change after you took sannyas? Because you have more responsibilities. Before sannyasi, I guess you are more or less like what we called life members in Iskcon. It is like you are an associated member, but when you take sannyas you become like a full-fledged member of Mahaprabhu's movement acting under the direct instructions of Srila Gurudev. It's good to have that realization that we are surrendered to Krishna and we can't go anywhere but to Krishna, because Krishna consciousness is our life. After so many years, I was always around devotees anyways, so why shouldn't I make it 'official'? So it was good - Srila Gurudev was happy about it. He really did want me to take sannyas and had said it before also, so I was fulfilling his desire. Actually, Srila Prabhupad had also wanted me to take sannyas too. I was a little bit late, but by taking sannyas you become closer to your Guru and you know what your duty is in life. Maharaj, can you tell us what your duty is? Srila Gurudev and Srila Guru Maharaj told me to preach and to do sankirtan. Srila Govinda Maharaj is arranging to send me to various places in the world and that is what I am trying to do. Srila Gurudev is taking care of me and I feel very fortunate for that. Such a great personality is taking care of such a lowly soul like myself. Now that Srila Gurudev has left Soquel and is currently in London and on his way to India, what are your plans? Srila Govinda Maharaj told me to go back to India so I am on my way. After Gaura-purnima he said he wanted me to go to Russia and preach there. So that is what I will do, I have to do what he says. I have to say, as part of the "new generation" we are beginning to step up and speak something about Krishna consciousness to our friends and the public. I am curious, what have you personally experienced is the most effective way to preach to people? First of all, realize what your Gurudev wants. Gurudev knows everything. He knows the proper way to preach, the proper mood of preaching - what to say, what not to say - so try to understand what your Gurudev wants in a certain situation. If you are in California or in Russia, try to understand what he wants. If you're fortunate he'll give you some hint. You don't have to try to understand independently although that is good too, but ultimately, try to fulfill that desire. Try to see the mood of Guru and try to see what he is trying to do. Srila Prabhupad, for example always said what he was trying to do. Right from the first he was saying he wanted to establish 108 centers all over the world and he only had a few years left in the world, but that was his vision. He encouraged his disciples to go out and establish these missions. Then he said he wanted his magazine 'Back to Godhead' sold and printed. He said he wanted sankirtan, he wanted book distribution, he wanted these things, he always said what he wanted. So Srila Gurudev will always say what is necessary and what is not necessary. If we try to hear what he says and then we try to do that, act in that line, then we will be safe. We will be secure and actually make some advancement. But if we just act whimsically with our own mind or what everybody else is trying to say, then our position is not so secure and we're probably not going to be in the line of Gurudev. Jai! Do you have a message for the devotees around the world? We are all very fortunate to have Srila Govinda Maharaj as our Guru. He is truly a great soul. The world doesn't see such great people very often. Even Srila Prabhupad said that he is very great. Srila Sridhar Maharaj said he is in many ways a better person than he. We are very fortunate to be in his presence, so we must somehow keep in contact with him and keep our relationship with him. I don't mean necessarily a hidden relationship, but keep some open relationship with Gurudev. He is not too sick and not too old that he can't guide us or direct us somehow. Even through his disciples, somehow try to keep some direct connection as possible. He says that a direct service connection, service, if we can do service to Srila Gurudev, that is our benefit in life. Srila Prabhupad always said that he was serving his Gurudev by coming to the West. Srila Govinda Maharaj has always said that he is serving his Guru Maharaj by seeing to Guru Maharaj's mission, his devotees and his deities. We also can help Gurudev by serving his mission. It seems that his desire is to try to serve that. He is our energy for that reason. Sripad Bhakti Premik Siddhanti Maharaj ki jaya! All I can say is thank you for your words and for the time you take to inspire all of us and give us the guidance for a brighter and better Krishna conscious life. Thank you Maharaj for sharing with us your special realizations.